Over a Billion Users of Smartphones, Action Cams and Digital Cameras Finally Have An Easy Way to Create, Share and Enjoy Full Quality 4K Videos. Menlo Park, CA February 22, 2017 - WeVideo today announced the addition of full support for 4K UltraHD (UHD) video to its leading cloud-based video editing and creation platform. This is the first time a web app has provided direct, unlimited, real-time support for creating and sharing pro-quality 4K video in a browser. WeVideo is completely Cloud-based, so 4K is available immediately to WeVideo subscribers—there is no software to update or new hardware requirements to worry about. Users with 4K media files can now take advantage of the entire WeVideo creative palette for video editing, graphics, green screen, special effects, speed control and more. 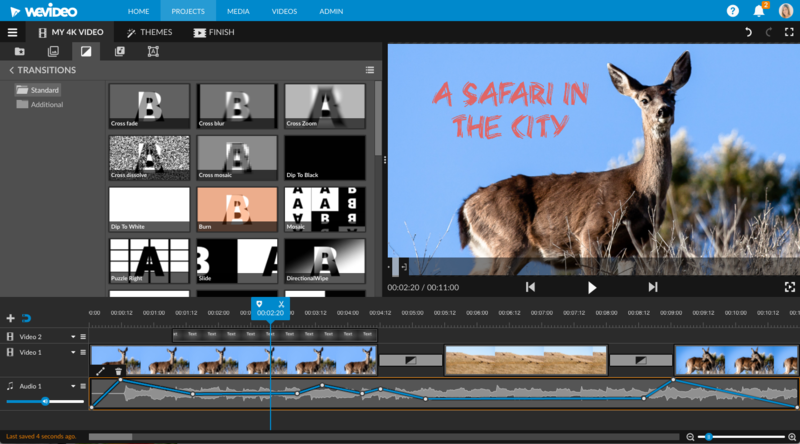 Thanks to the all-new WeVideo JumpStart™ feature, users can start editing immediately without waiting for the video to upload to the Cloud or to be imported into software—they just click on locally stored 4K media files and go. WeVideo is built for the future in HTML5, providing the speed, responsiveness, security and expandability needed for the best and most complete browser-based video editing experience. WeVideo lets the user freely mix and match 4K video, including H.265, VP8 and VP9 formats, with the more than 600 audio, video, and graphics media formats supported by WeVideo. High resolution photos reveal remarkable detail when edited in 4K video using WeVideo. Stored in the Cloud, WeVideo projects can be accessed anywhere, at any time, on any device. Finished projects can be streamed from the web or saved offline to watch on 4K capable TVs, projectors and devices. WeVideo CEO Krishna Menon said, "Consumers have so many ways to capture stunning 4K Ultra HD video. It's offered on the phones and cameras we carry every day. Frustratingly, making the most of that incredible quality has been almost impossible. At the very least it required consumers to invest in the most expensive hardware and complicated software. Thanks to WeVideo, now everyone can create amazing 4K movies and share them with anyone anywhere. Whatever laptop, desktop or Chromebook you have now, WeVideo offers you a complete, high performance creative video toolkit to turn your incredible 4K footage into spectacular video stories for fun, family, school, and business." All WeVideo users can now import and edit 4K Ultra HD video immediately; there is no cost. WeVideo Unlimited subscribers can export their finished 4K projects at no additional cost. 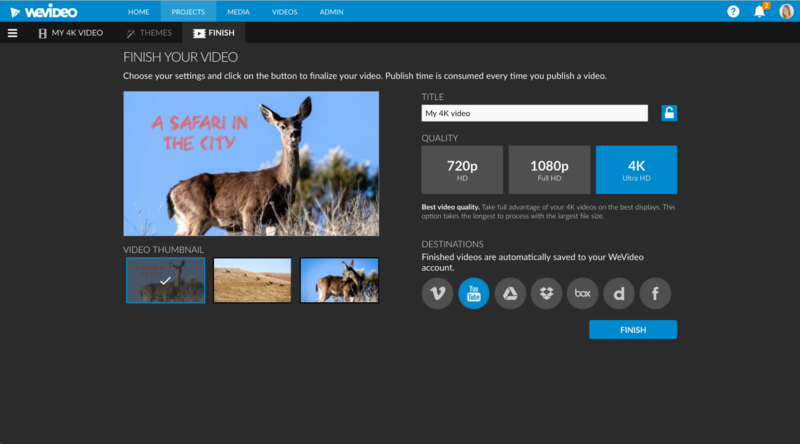 WeVideo also offers options for Flex and Power account holders to export in 4K. 4K is available on all devices currently supported by WeVideo. WeVideo is entirely Cloud-based, enabling it to provide the massive video processing power required for 4K video editing to almost any Windows and Mac laptop or desktop, and even to lighter weight devices such as Chromebooks. 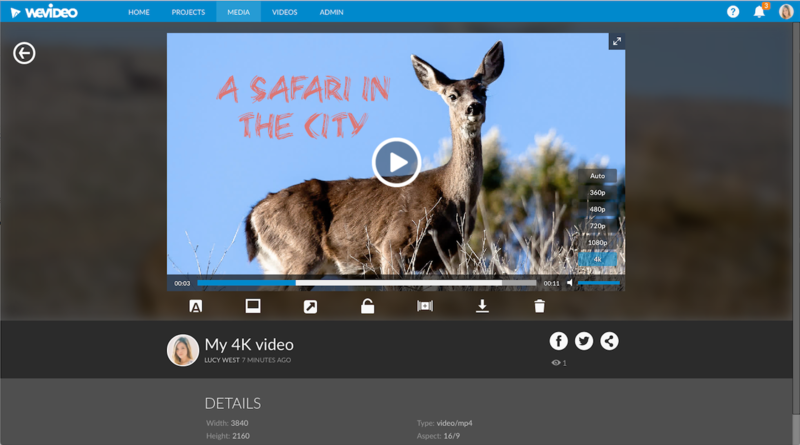 The 4K feature is fully integrated with the familiar and intuitive WeVideo interface enjoyed by millions of consumers, students and business users worldwide. WeVideo offers free, introductory accounts that let people begin to explore many of its powerful features. Flexible and affordable subscription options offering a robust set of expanded features start at just $4.99/month. WeVideo also offers Education subscriptions to fit classrooms, schools and districts, as well as state- and national-level deployments. Every WeVideo subscription includes a deep suite of video editing and creative tools, Cloud storage, and much more, all accessible from both browsers and mobile apps on Android and iOS. WeVideo is a powerful, easy to use, cloud-based video creation platform that is the digital editing and storytelling choice of more than 18 million consumers, students, businesses, and third-party media solutions. WeVideo is available from virtually any computer or device at home, school, work or on the go to capture, edit, view and share videos. Built for the future in HTML5, WeVideo brings maximum speed, responsiveness, security and expandability to browser-based video editing. WeVideo is a Google Play Editors' Choice selection with more than 7.5 million downloads to date. WeVideo is also the exclusive digital storytelling solution of Google’s Education Creative Bundle for Chromebooks and a Microsoft Education Partner. More than 6,500 schools use WeVideo to enhance classroom learning. For more information and to try WeVideo yourself, please visit http://www.wevideo.com. Stay up to date by following us on Twitter at @wevideo or visit us on Facebook at https://www.facebook.com/wevideo.